Google I/O doesn’t officially start until Wednesday morning, but the developers’ show is already seeing some action. Two warring factions, the Resistance and the Enlightenment, are vying for control of various “portals” at key landmarks throughout San Francisco, which are leaking dangerous amounts of radioactive energy, to determine the fate of the city and ultimately the world. If that scenario sounds a bit incredible, it’s because it’s playing out not in reality but on dozens of attendees’ Android-powered smartphones, within a game called Ingress. The mobile game, which Google is referring to as an MMOG, or a massively multiplayer online game, is currently in closed beta and only available by invitation from the company’s Play Store. But it has already attracted some pretty serious players at I/O, as part of a competition at the show. Ingress is a geolocation, augmented reality-type game. It plots the player’s real-life location on a grid similar to Google Maps, which uses actual data served up through the Android phone’s location services that doubles as elements within the game. In other words, the player could be walking past a fire station at an intersection in real life, but in Ingress that fire station might be a portal that must be defended by the player lest it get captured by the enemy and used for evil. “I’ve been able to meet new people through the game, and it helps me get out and about,” said Todd Neumann, an I/O attendee from Huntsville, Alabama. 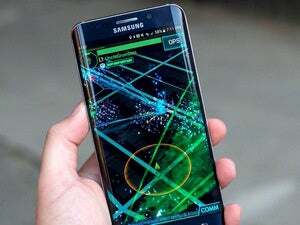 At the moment there are more than 100,000 portals globally within Ingress, a Google representative said at I/O, which are meant to be discovered by players as they explore and interact with their actual physical surroundings in real life. Gamers can gain points, “level up” and unlock new objectives in Ingress based on how may portals they uncover and how they engage with those portals, such as by “hacking” them for supplies or by attacking the portal if it’s controlled by an enemy faction. But Lukas Jarosch, cofounder of the Munich-based Android gaming engine Andlabs, sees Ingress as mostly just another way for Google to gain more data about its users. “It was too much walking around, and I didn’t want to be taken on all these detours,” he said, adding that he’d like to see more gameplay features in future iterations. “Right now, it’s just about hacking portals and making fields, and not much else,” he said. For the kick-off competition at I/O, dubbed “Operation Fan-Out,” Google has designated more than a dozen landmarks around San Francisco as key portals within Ingress, such as the Palace of Fine Arts, Coit Tower, the Chinatown gate and the Martin Luther King Jr. Memorial. Dozens of gamers at the show lined up on Tuesday to register their devices for the opening competition, which runs until 9 p.m. on Wednesday night. Players gaining the most points will unlock hidden prizes at I/O and also free drinks at a special Ingress meetup being held later during the conference, Google said. The game was developed by Google’s Niantic Labs, which is also the workhorse behind Google’s Field Trip location discovery app for Android and iOS devices. Field Trip is designed to alert users to interesting landmarks, locations and places of historical significance as they go about their day. There is some overlap between Ingress and Field Trip. Some of recommendations provided by Field Trip may also appear reconfigured as portals in Ingress, but getting more personal geolocation data is not what Ingress is about, Google argued at I/O. “The game is about just getting out there and enjoying your local community,” one rep said. Google I/O officially begins Wednesday morning.